Antibacterial, stimulating and clearing. The aroma of this Organic Rosemary Essential Oil from Morocco is more reminiscent of the herb than its conventionally produced counterpart, with more herbaceous depth, woody undertone, and clean, crisp top notes. Rosemary stimulates the central nervous system, and inhaling this oil aids mental clarity and helps improve learning and memory. It also helps clears sinuses eases tension headaches. 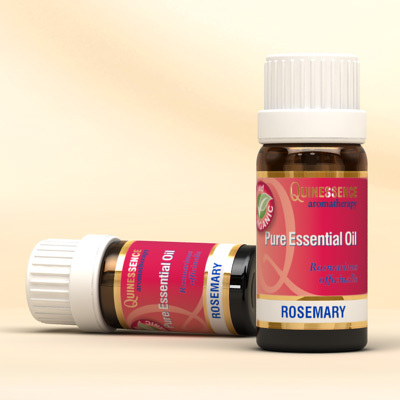 Organic Rosemary Essential Oil is a circulatory stimulant that can be used in massage and baths to improve poor circulation, and deliver a warming and soothing action to digestive disorders, backache, stiff joints, and muscular aches and pains. If you are recuperating after an illness or feeling lethargic, rosemary oil added to a bath or massage oil boosts the immune system, energizes and revives the body, and refreshes the mind. To keep hair healthy, shiny and soft, add Organic Rosemary Essential Oil to a base shampoo and conditioner, or a carrier oil such as coconut and massage for a scalp massage. Because rosemary stimulates hair follicles it has been used for hair loss since ancient times, and recent research has proven that it really is effective. Organic Rosemary Essential Oil is valuable in skin care where it strengthens the capillaries and works to regulate excessive oiliness, whilst its antibacterial properties help spots, pimples and acne.